In 2010, WU teamed up with Ashoka to inspire social entrepreneurship and create opportunities for our WU executives to create positive social change across the globe. Since then, 46 WU employees have been selected to participate in the Ashoka Executive in Residence (EIR) program, benefitting more than 35 organizations in 17 countries. The mission of the Ashoka EIR program is to make everyone a “change maker,” in order to solve social problems around the world. To help make this happen, the program provides pro bono executive consultation by embedding WU leaders for two-week assignments with NGOs that are led by Ashoka Fellows, leading social entrepreneurs recognized for their innovative solutions to social problems and the potential to change patterns across society. While these life-changing Ashoka assignments benefit the NGO, they benefit WU too – with our EIRs bringing back new leadership skills, new business opportunities and new ways of thinking. Meet our WU Ashoka EIR class of 2016. 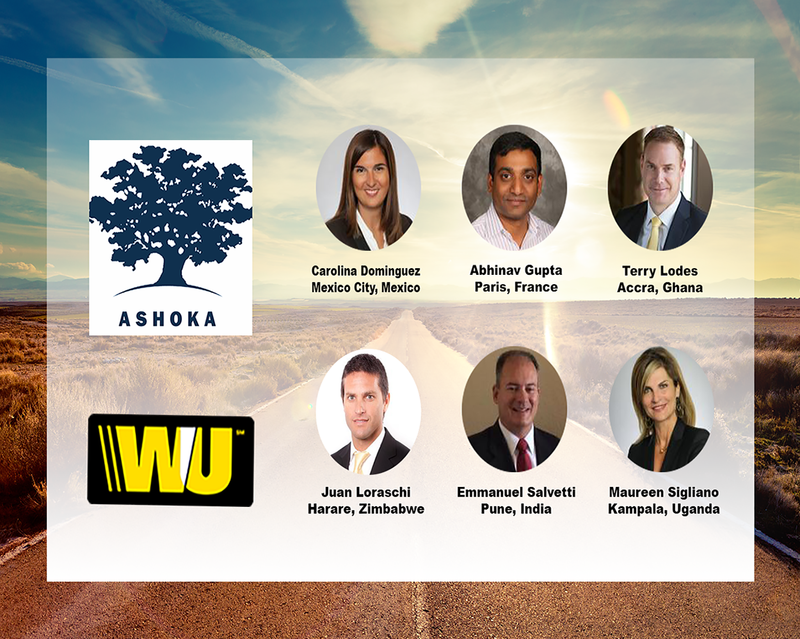 Learn about their Ashoka experience and their perspectives on leadership, global business and giving back to communities by “liking” the WU Careers Facebook Page. Stay tuned to check out their blog posts! Carolina Dominquez, Compliance: Carolina recently completed her Ashoka EIR placement in Mexico, working with Reinserta un Mexicano, an organization dedicated to stopping the vicious circle of crime in Mexico by transforming the country’s prison system. Efforts include fighting for children born in prison, as well as helping teenagers reintegrate into society. Abhinav Gupta, Country Manager-India: Abhinav is heading to France to work with SINGA, an organization dedicated to helping refugees reach their full potential through social interaction and entrepreneurship, and to change society’s perception on refugees by revealing the enormous enrichment that refugees bring to their host communities. Terry Lodes, Human Resources: Terry recently returned from Ghana where he worked with Soronko, an organization dedicated to equipping rural Ghanaian youth with problem solving skills through the study of Science, Technology, Engineering and Mathematics (STEM) via an interactive supplementary curriculum and apprenticeship program. Juan Ignacio Loraschi, AEU: Juan is headed to Zimbabwe to work with Young Africa. This NGO is a skills training organization, with a mission to empower young people through vocational and technical skills training combined with life skills and entrepreneurship training. Emmanuel Salvetti, Finance: Emmanuel’s EIR placement is with Lend a Hand India, an NGO dedicated to creating better lives for India’s poor by improving access to education, vocational training, career development and employment and entrepreneurial opportunities. Maureen Sigliano, EMEA-APAC Marketing: Maureen will be making a difference in Uganda, working with NGO, COBURWAS International Youth Organization to Transform Africa (CIYOTA) – a grassroots initiative empowering displaced youth to unite and transform communities with a focus on creating sustainable peace and prosperity through innovative education and non-violent leadership techniques.